CooksRecipes has quality, kitchen-tested recipes for beef appetizers, canapés & hors d'oeuvres that are perfect for parties and entertaining. These appetizer skewers of marinated flank steak offer the taste of the Orient. 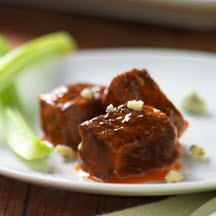 Bite-size chunks of fork-tender, braised country-style beef ribs served in a spicy-hot Buffalo sauce sprinkled with blue cheese crumbles. 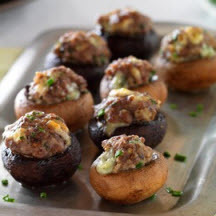 These perfectly bite-sized mushrooms are stuffed with a savory blend of ground beef, blue cheese and chives.